My Twitter Auto DM Petition. Sign up! I am not a huge fan of Auto DMs. To be honest with you I hate them. There are a few times when Auto DMs on Twitter should be used but most of the time the answer is no. I wanted to start a Twitter Auto DM petition. 1. You find Auto DMs completely void of personality. 2. You find Auto DMs are not genuine. 3. You just dislike Auto DMs in general. 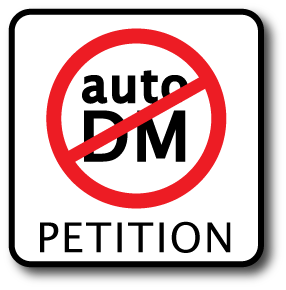 Sign below in the comment form if you dislike Auto DMs. Steal the logo and put it on your page. Spread the wealth. Spread the info. Or if you completely disagree with what WE are doing..
Sign below in the comment form. http://acrilan.spb.ru/ (812) 740-65-78 Ремонт квартир, кабинетов и помещений в С-петербурге. Где найти надежную компанию по ремонтным работам квартир и офисов в С-петербурге?! I'm completely against. You have my word for that. I completely agree with you. Мир автомобилей. Самые нужные автоновости и новости из мира машин. If they filled out their profile correctly, that's all that's needed. If they don't understand how to do that, they probably can't contribute much more of value until they understand how to use Twitter properly. That's a personal pecadillo of mine. Incomplete or nonexistent profile info. This was a wonderfully helpful article! I like your words, like this concept,excellent! The crucial indicate realize is that this applies not just to , but also in order to. Meba Electric Enterprises is one of specialized manufacturers and exporters in line of low, middle and high voltage electric equipments. Many women continually like the Lia Sophia Jewelry whoop it up which is generally well thought-out by the management of the Lia Sophia Company. The management of this wonderful company generally organizes this whoop it up on behalf of the benefit of many women who are inwards darling with the wonderful brands of the Jewelry brand. The whoop it up is generally an way wherever newer models of the jewelry products are showcased to the public. CADIA sanitary specializing in the production of Ceramic wash basin, Cabinet Basin, One-piece toilet, Two-piece toilet, Wall-hung toilet, Above counter basin, Under counter basin, Pedestal basin, Wall-hung pedestal basin, Urinal, Squatting pans W.C, Bidet, Mop tub ect. LY digitizing provides professional cheap custom embroidery digitizing and vector art services. All formats conversation, test sew, quick turnaround. If you are insterested in our service, welcom to visit http://www.lydigitizing.com Maybe we can digitize a Simba for your shirt. Thank you for your post. It is very good. Signed, I don't like being communicated by a robot that just completely void of personality. Inexpensive sinks are simply injection-molded thermoplastics. These are often deep, free-standing sinks used in laundry rooms. Subject to damage by hot or sharp objects, the principal virtue of these sinks is their low cost.